If someone you care for has been arrested and taken into custody in San Fernando, or you’re in search of San Fernando Valley bail bonds, our local bail bondsmen can help you quickly and professionally. Our office and agents are local to the San Fernando Valley and can work with you personally at the jail or your home, office or our office or whenever it’s convenient for you. 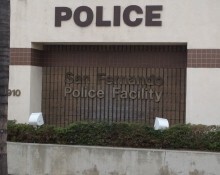 We have years of experience working with the San Fernando Valley Jails and Police Stations. Speak with one of our expert, licensed bail bondsman for arrest, charge and booking information at any of the San Fernando Valley Jails. We can work quickly for the release of your loved one or friend. If you’d like to speak with a local San Fernando Valley bondsman, and want to get the bail bond process started right now, call and speak with a friendly, licensed bail bondsman now at 818-425-3325.